I hope you don’t mind this simple little soup popping into your inbox or feed. I realise that other food bloggers are posting elaborate year-end round ups of their best recipes, and laying out plans for improving blog and blogger. I wish I had got around to the former, to be honest. I will however be making some changes here on food to glow (and probably on myself too). But like most things with me – to paraphrase Loyd Grossman – they have to be deliberated, cogitated and finally digested before coming to fruition. Watch this space. But not too closely: you may be waiting awhile. The soup I will not be changing. It is wholesome, full of flavour, and very January in its feel. A perfect soup to bridge the gap between shedding December’s excess and embracing January’s penitence. We love the mix of textures and the subtle earthy vibe from the North African spices in this easy, quickly-made soup. It was a huge hit when I first made it for my family. I have used Savoy cabbage – so plentiful and cheap at this time of year. Of course I wanted to use kale – it is still growing in my garden after all – but I know I bang on about kale too much. Use any winter greens that you fancy though. And for that matter, sub out the freekeh for quinoa, amaranth or bulgur wheat if you like, altering the cooking time as needed. And add in cooked pulses such as lentil or chickpeas to give even greater staying power and nutrition. I do that sometimes. So much for not changing anything! Just a side note, I actually cooked the freekeh in a larger batch and hived off some to add into the soup just before I was ready to serve. But I know it would be easier for most of you to do it as a one-pot recipe, so that is what I have written up. Click on these links to find my recipes for preserved lemons and labneh. Both are in-advance kind of things (the preserved lemons take a month!). If you don’t have them just sitting around waiting to be useful, I have given alternate suggestions. Other than this soup I have also just made (and we have polished off) my Hoppin’ John, for New Year’s Day luck Southern style. 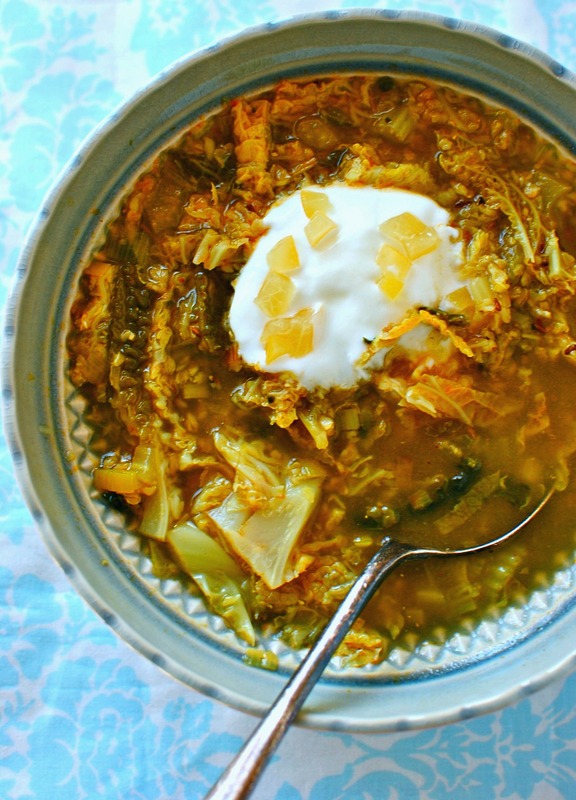 We ate this Creole-spiced black-eye pea soup mixed with another lucky food, sauerkraut – a highly recommended add-in. 😀 What soups are YOU making right now? In a large lidded saucepan saute the onions – or leeks – and carrot over a low heat for a few minutes. Add the cumin, caraway, garlic and freekeh. Cook for one minute then add the stock. Bring to the boil then turn down and simmer for 10 minutes. 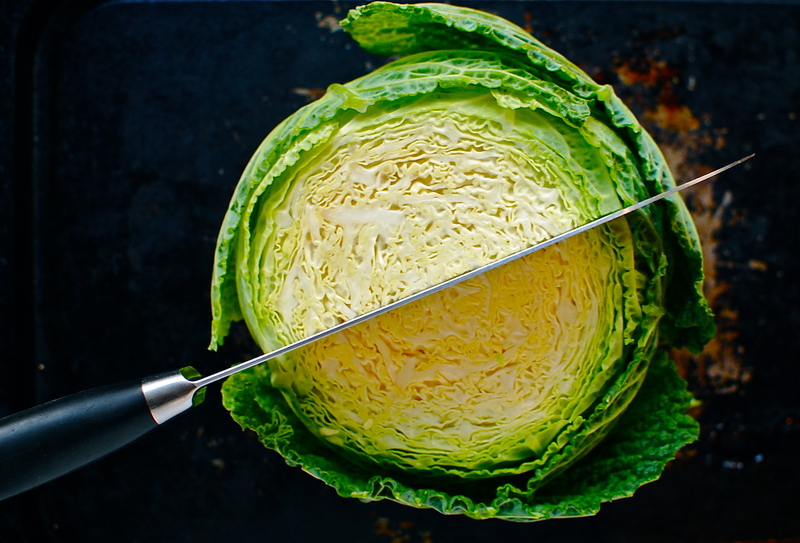 Add the chopped cabbage and cook just until the cabbage is going soft – about five minutes. Or longer if you prefer less crunch. Serve with a dollop of labneh or yogurt and a sprinkle of preserved lemon or zest and juice. This looks lovely! Next time the cabbage is on sale at the store I’ll definitely be giving this a go. Mmm that looks wonderful! Never heard of freekeh, shall attempt to try to find it! I bet you will find it in your local health food store, and of course on the internet. I have another freekeh post lebanese freekeh and fig salad (http://bit.ly/18ZFdEu), in case you find the freekeh and want more ideas. Let me know if you make it. Ahhh…I see where the preserved lemon comes in handy!! I will use the single Meyer’s in the fridge for this one and bulgar (or maybe quinoa for a change) from the pantry. This looks sublime. We had our head of cabbage and black-eyed peas yesterday, if simply cooked. I put my zing was in the caesar salad instead. Thankfully, I have an EXTRA head of cabbage waiting to be used. This past week, we enjoyed a Lebanese lentil soup with turnips, no-meat chili, a Thai veggie-and-tofu laksa, and a curried squash-and-coconut-milk creamy variety. Each were served with a healthy portion of steamed greens (mustard, turnip, kale, spinach) or fresh salad and baked bread or muffins. Soups are great because, for minimal time spent in the kitchen, there is such enjoyment with a large crowd to just sip and enjoy and visit away. You don’t need a look back for improving your blog. Just keep on keeping on! Can’t improve on perfection. Cheers, Kellie. And Happy New Year! Great, great sounding menus. Just my kind of food (as you will have noticed!). Laksa is one of my all-time favourites and I have a recipe here on food to glow somewhere. But you won’t need it obviously. 😀 I am a bit neglectful of turnips as they play havoc on my digestion but perhaps baby ones are okay, esp in a Lebanese lentil soup. That really sounds lovely. Thanks for your always kind and generous comments, Shannon. I really appreciate the time you take to read and comment. All the best for 2014, and using that new kitchen of yours! A delicious soup! Perfect for the freezing weather here in ND. I love the idea of this soup and it’s really the perfect weather for it isn’t it? Does this one improve over a few days? You have also reminded me that I need to top up my labneh jar. You know, it has never made it past a day. I don’t tend to make large quantities of it (too many other things to make!) but I would just leave out the yogurt and I’m sure it would be fine. The spices would certainly get a chance to meld. Luckily the freekeh doesn’t seem to swell and take over too much upon sitting. Unlike pasta. This looks healthy & delicious and perfect for a winter warming meal! Can’t wait to try it out! 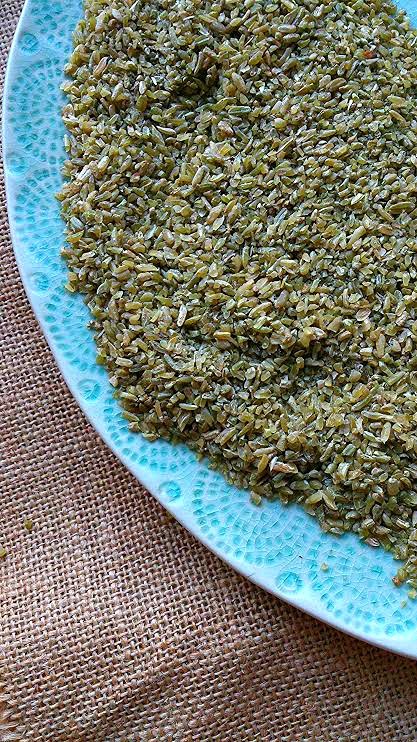 I’m intrigued by freekeh – I have no idea what it is. I assumed it was bulger wheat, but looking at the picture I see it is something else entirely. Soup sounds delicious. We’ve been living of leftover soup. Happy new year again Ms Kellie… your soup sounds delicious… I haven’t had freekeh since it first made its debut in the 90s, if memory serves me right… but it’s an ancient grain, isn’t it. Happy cooking to you. 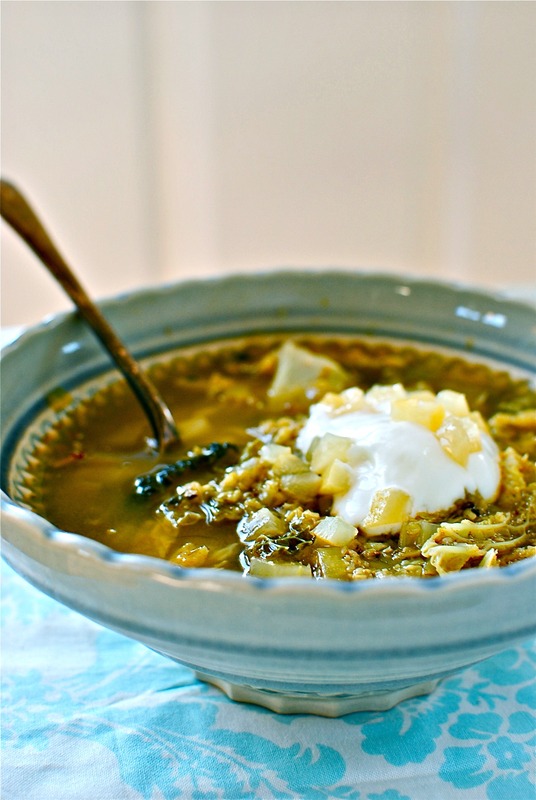 Soup is on the menu this week and Freekeh and Greens sounds incredible! Happy New Year Kellie! wow this looks amazing. I have just blogged a soup too. Very simple, and delicious but I’m not sure it’s in this league! Happy New Year! Such a hearty and nutritious soup to start the new year off with Kellie. Love it! So here’s my confession….I’ve been taking a break from cooking much (after a huge Christmas feast) so the last soup I made was organic roasted tomato and red pepper…heated from a box! Just being honest here 🙂 Doing a huge fridge/freeze/pantry clean out right now, then I’ll be ready to start cooking again when the kids go back to school next week. Hope your new year is off to a fabulous start! Beet and lentil bourguignon AND black bean mole chilli? I think your guests will attempt to out-stay their welcome with dishes like that. Sounds well-lush, Katie! PS I put preserved lemons on anything vaguely suitable. I kid myself that it isn’t like adding salt. LOL! Ha, we often joke we feel like we’re running a B&B because we have way more visitors here than we had living in the US. 😉 I like the way you think, preserved lemons are a perfect substitute for salt! Although salty if you rinse them first, they have to be better for us. 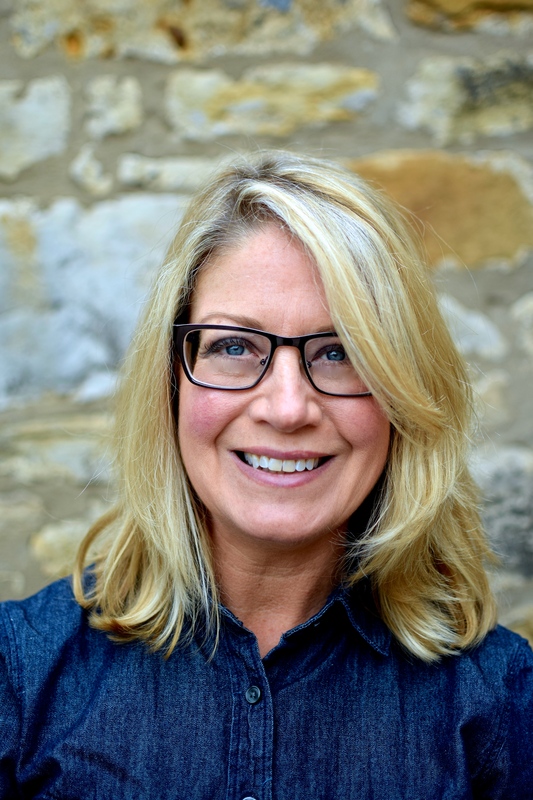 Hello Kellie, one of my resolutions is to make more recipes rather than just save and store them. so glad you (and your flatmate) enjoyed this! You know, I have the same ‘resolution’ too. I have virtual stacks of recipes crowding my files. I hope to have time to at least organise them mrs efficiently. You sound way more on the ball than me. 🙂 Super that you used quinoa. I always like to give as many options as I can and still keep the sense of the recipe. Oh yes we loved it! Happy New Year Kellie! I knew you would come up with a wonderful recipe that also happens to be good for you at the start of 2014. I got back fro skiing last night and you know that that means. Far too much of the rich, dairy foods, breads, desserts meat with NO veg! I had quite a few nights when I was up with a bad tummy, I simply can’t take that food for long periods of time. So I will be on soups, salads and veggies for this month until my stomach becomes less bloated! mmm thanks for this recipe! Just what I feel my body needs after the christmas excess! This looks great! It shares many flavor similarities with a lemony lentil soup I posted not that long ago, which I also finished with lemon and labne. I love the idea to use cabbage, too. Hi Allison. Thanks so much for stopping by and commenting. 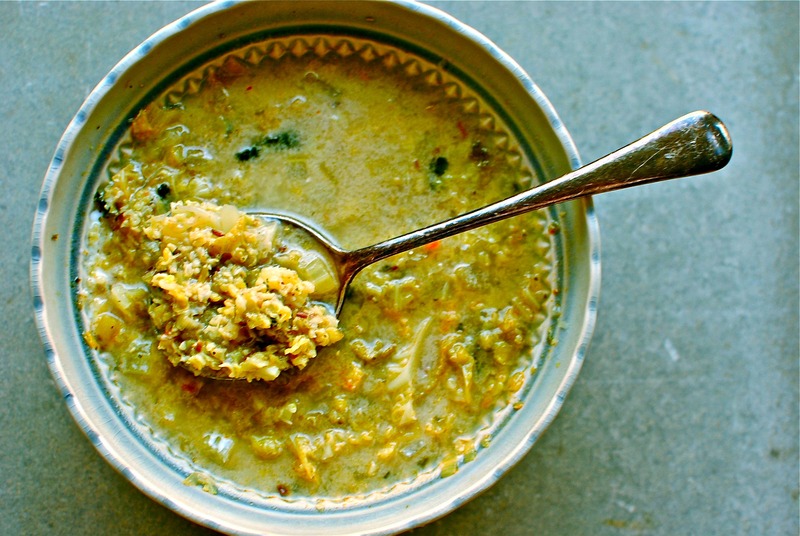 I love lemony lentil soup (I have one that is a staple but still have blogged it!) so I will have to visit you and see what you do with yours. I am crazy about lemons so they feature a lot on food to glow. Just made this for lunch. Wow, it was amazing. I had an eggplant to use up so I roasted it with cumin and za’atar to top the soup along with the labneh and preserved lemon. This is going on my favorites list. 🙂 Thanks Kellie! Awesome Katie! I am honoured to have been in your kitchen 😉 That sounds like a great little topping too. I am always using up little odds and ends to make garnishes. Hate waste, and love to garnish!